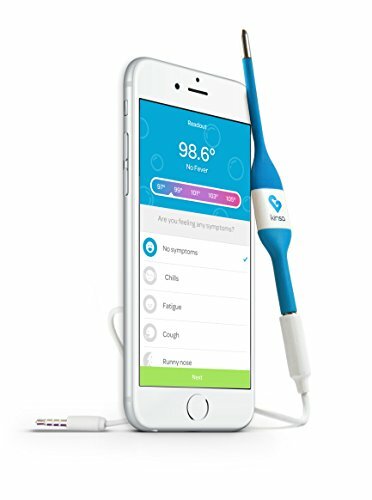 Kinsa's pediatrician-recommended fast, accurate & reliable Smart Stick thermometer, now with storage pouch. Compatible with all iPhones 5 and up (including iPhone X), though please note you will need the lightning port adapter if you have an iPhone 7, 7 plus, 8, 8 plus, or X. Also compatible with most major Android devices. The free app records fevers, symptoms, medication dosages, and other important health data in a time-stamped log. The thermometer takes accurate oral, and underarm temperature readings - as well as rectal readings as a baby thermometer - and its battery-free design means it never dies when you need it most. Keep each family member's health details in your pocket for you or your pediatrician. Keeps kids entertained with bubble popping game. Compatible with all iPhones 5 and up (including iPhone 8 and X -- lightning port adapter needed for iPhone 7 and up) and most Android devices; Kinsa plugs into your iOS or Android device, giving an accurate reading on the free app in seconds. If you have any questions about this product by Kinsa, contact us by completing and submitting the form below. If you are looking for a specif part number, please include it with your message.